Thanks to Teresa Moore of Moore Ink., for bringing me in to get some fresh images for the Highline Medical Center Foundation annual report. While Highline Medical Center is now CHI Franciscan Health, the Foundation still goes under the original name. They needed me to work quickly, as the hospital staff were being kept from their regular duties to help us out. I ran around with staff from the Foundation that assembled the volunteers to be photographed in different situations. They needed to have images to show off new technologies and special services they were able to obtain through donations to the Foundation. They also wanted to highlight some of their people, giving recognition to the hard working staff. These were all made using natural light, the actual people that do these jobs, and the “models” are people who generously volunteer at the hospital all year long, not just for photo shoots! What an incredible bunch of people that I was fortunate enough to spend some time with. 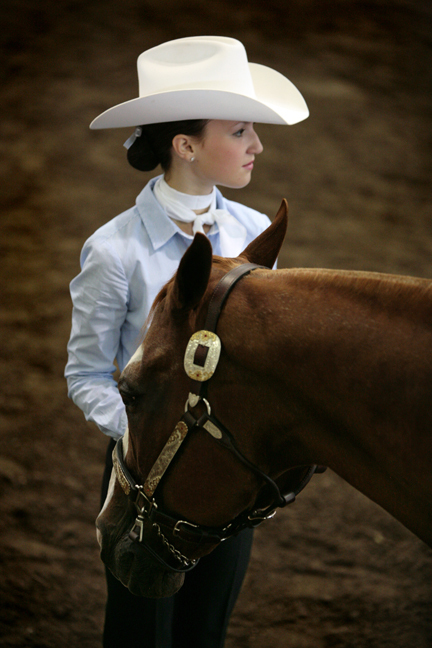 Last September I spent a day at the Puyallup Fair looking for images. I walked into an extremely dark horse barn at the end of the show and found a striking Graysen Stroud listening to the judges. As I try to collect my favorite images, I came across this which I hadnt had a chance to post during the busy Fall season. 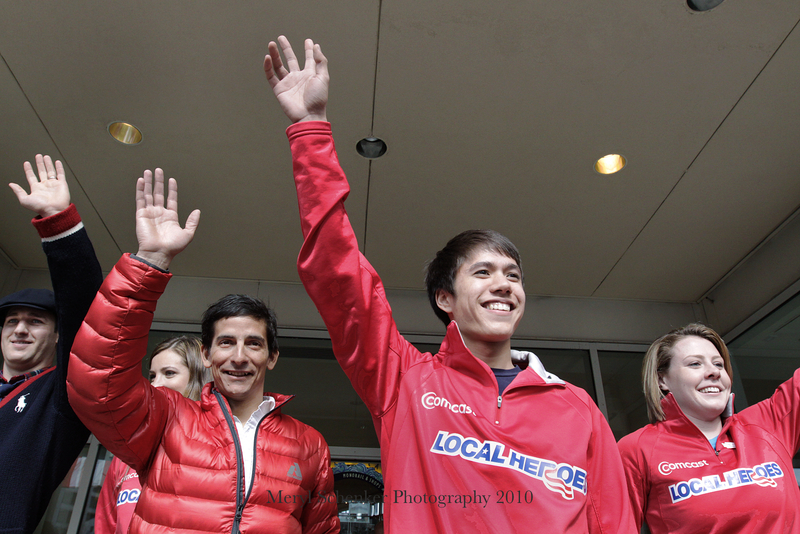 Olympians left to right, Christian Niccum, Luge, Roberto Carcelen, Cross-country skiing, J.R. Celski, Speedskating, Karen Thatcher, Hockey, are welcomed home to Seattle at Westlake Center on March 4, 2010. 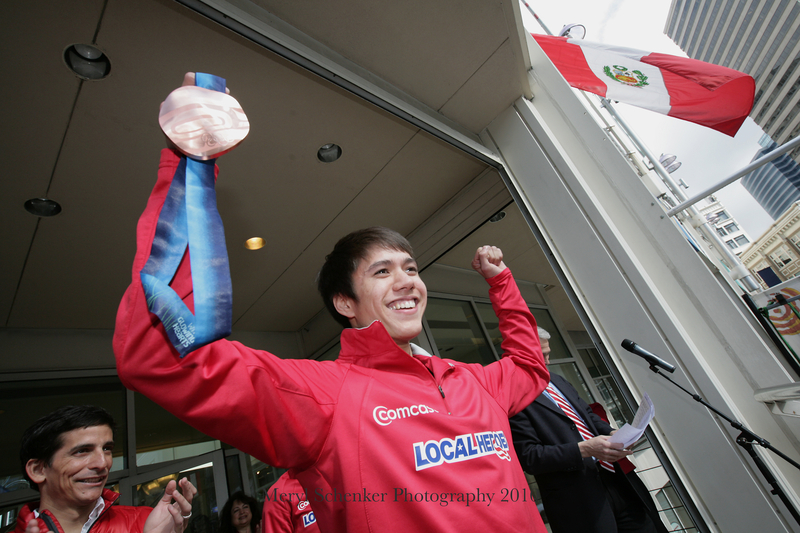 King County Executive Dow Constantine, left, helps welcome home Olympians at Westlake Center on March 4, 2010 including Torin Koos, nordic skiing, and Christian Niccum, luge, holding his daughter Hayden Lulu Niccum. Olympian J.R. Celski holds up his bronze speed skating medal. Olympic Bobsledder Bree Schaaf hands over a computer that she just signed for a fan at Westlake Center on March 4, 2010. 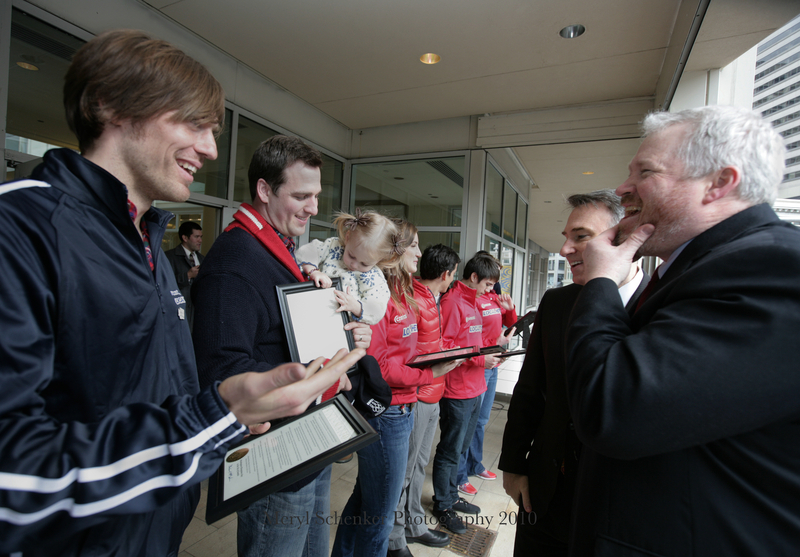 Mayor of Seattle Mike McGinn and Olympic nordic skier Torin Koos, talk about McGinn's beard while McGinn hands out Proclamations. 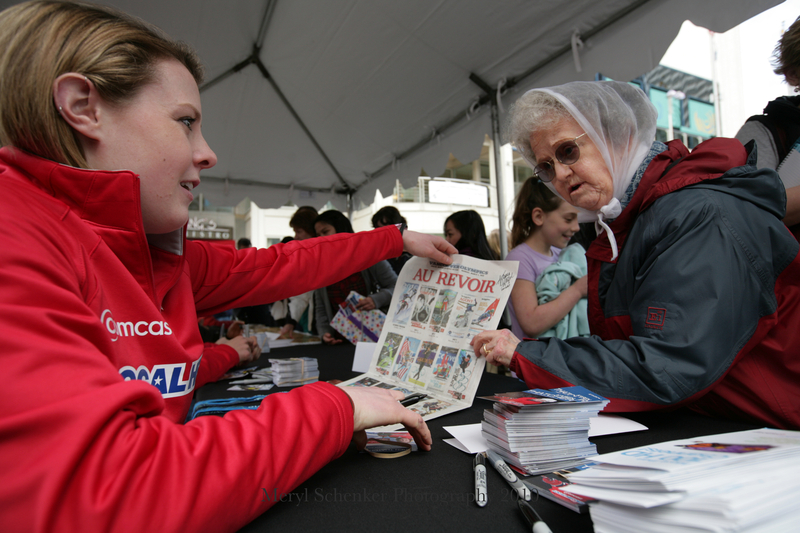 Olympic hockey player Karen Thatcher signs a newspaper for Carol Scoggin of Seattle. 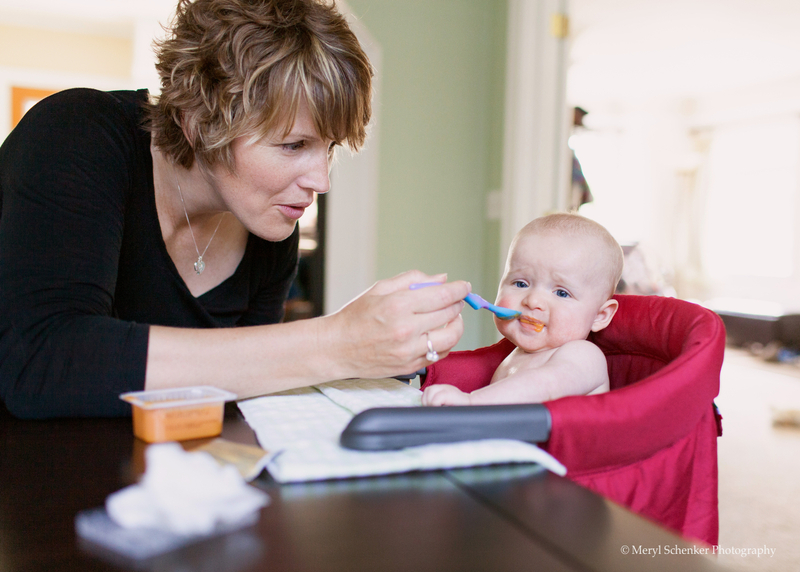 I took this photo while working on a self-generated photo story for the Seattle Post-Intelligencer newspaper where I worked for over 12 years. 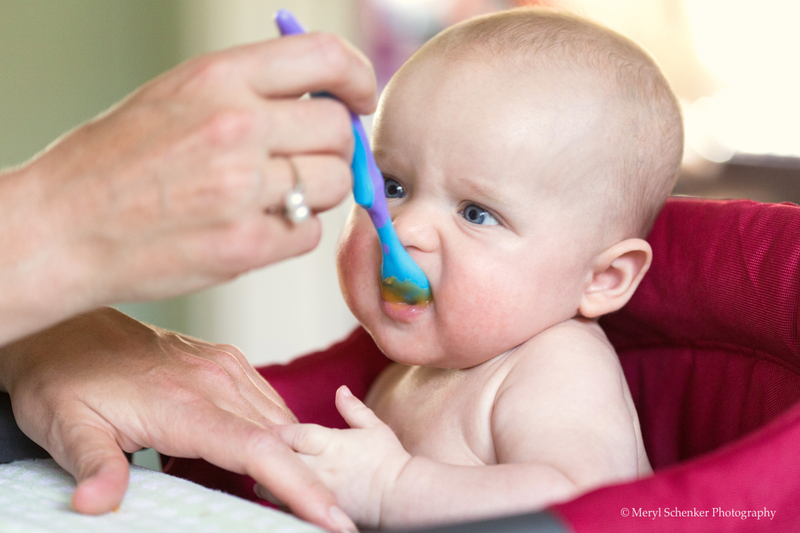 I thought I’d post it first on my new blog because it’s a fairly unique moment. I spent a lot of time with the Governor during her first 100 days in office. 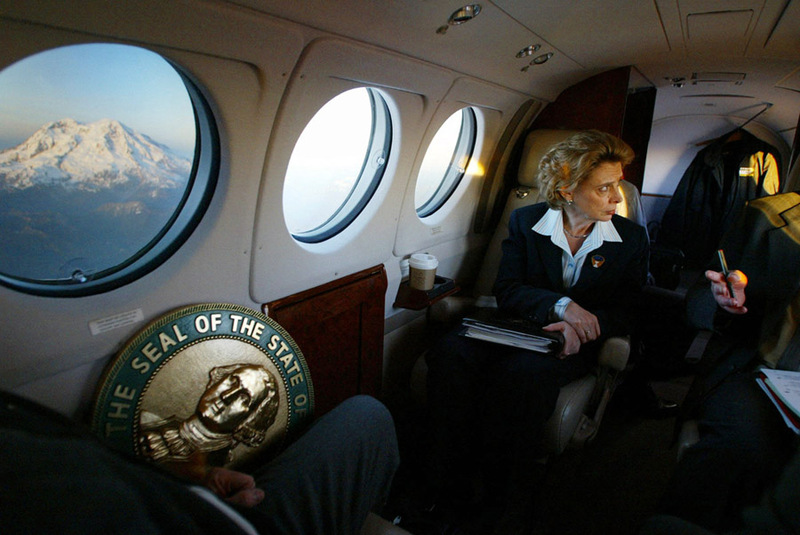 After gaining her trust, I was allowed to travel on a small private plane with her as she traveled back and forth to Yakima for government business. Technical tip- Usually, it would be very difficult to get the inside and outside exposure correct but because there was a polarizing filter on the window, Mt. Rainier can be seen clearly. There is no photo manipulation in this photo, or any of my photos. If you were in this situation and there was no filter on the window, you would expose for the outside and use flash inside the plane-preferably bounced.